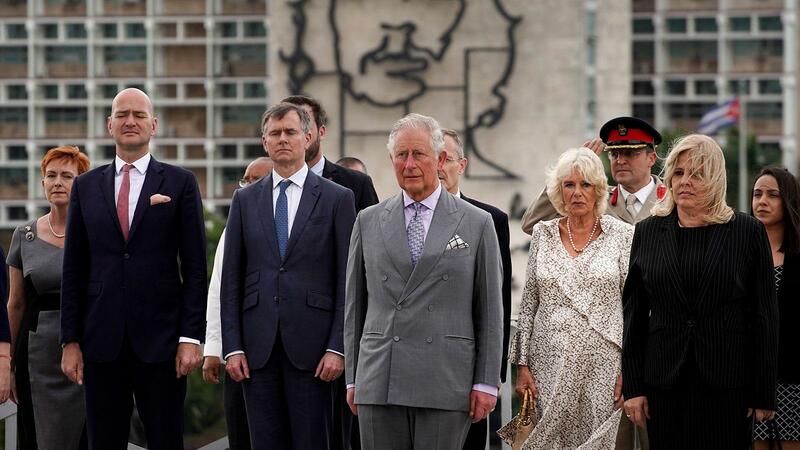 Britain's Prince Charles, the Prince of Wales, center, and Camilla, Duchess of Cornwall, center right, attend a wreath-laying ceremony at the Jose Marti Monument during their official visit in Havana, Cuba. In a history-making trip that is generating international attention, Prince Charles and his wife, Camilla, began an official visit to Cuba on Sunday evening, marking the first time that a member of the British royal family has traveled to the island since the 1959 revolution. The visit comes as part of a 12-day tour of Caribbean nations. The royal visit represents the highest profile foreign delegation on the island since U.S. President Barack Obama and his family spent two days in Havana exactly three years ago—part of his administration’s efforts toward a rapprochement in U.S.-Cuba relations. Like Obama, one of the first activities of Charles and Camilla was to lay a wreath at the monument of Cuban independence leader Jose Martí near the Plaza of the Revolution. On Monday, the royal couple was scheduled to have a state dinner with Cuban president Miguel Díaz-Canel at the Palace of the Revolution and meet with members of the famed music group the Buena Vista Social Club. Prince Charles’ program includes participating in the inauguration of a solar energy park outside of Havana and a tour of the restored parts of Old Havana. The royal family has often been used as goodwill ambassadors to the British commonwealth and former colonial countries around the world. The significance of this trip, though, is widely perceived to be an effort to build closer economic ties between the U.K. and Cuba as Britain struggles with the fallout from the Brexit upheaval. Cuba’s tourist sector counts on some 200,000 British travelers annually—a figure that Cuban authorities would like to expand in the coming years. British corporations have close to $100 million in investments on the island. Britain’s full diplomatic and economic relations stand in sharp contrast to those of the Trump administration’s punitive policies to tighten U.S. sanctions against Cuba amidst the growing crisis in Venezuela. In a letter to Buckingham Palace sent last month, Sen. Rick Scott (R-FL) pressed Prince Charles to “reconsider” his trip to Cuba, and support “standing up for democracy and freedom” by coming to Florida instead. Sir Alan Duncan, the British minister of state for Europe and the Americas, responded to Sen. Scott that "like a number of other countries, we believe that the best way to promote human rights and encourage a Cuba that fully respects fundamental freedoms is through practical diplomacy, such as with this visit." According to a spokesman for the U.K. government, the royal trip is “part of our longstanding approach towards Cuba of engagement and frank dialogue over the issues that divide us like human rights, but also the engagement towards progress on the matters that bridge us together."